Provençal villa at Lorgues (3 km). 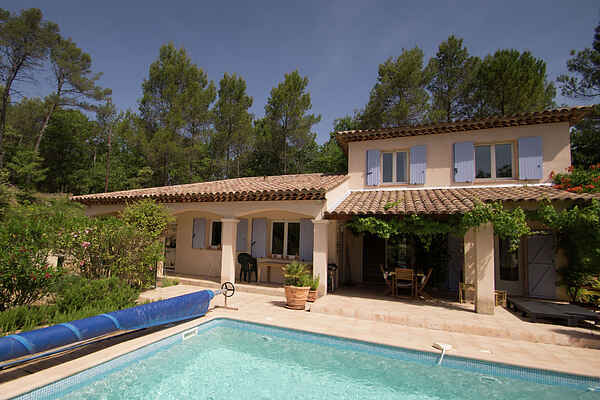 This beautiful villa with private pool is situated in a valley in the forests of the beloved Lorgues. Outdoor dining while enjoying the smell of pine trees, the sound of crickets and the view of your illuminated swimming pool (which can be heated to 24 degrees Celsius)... It doesn't get much more Provençal than that. With the separate guest accomodations this villa is ideal for a large party. There is an outside dining area on the covered (heated) terrace at your disposal, a brick BBQ and a nice lounge area. The swimming pool is not fenced, please be careful with small children! The Var is known for its pine forests, vineyards (for that chilled glass of rosé), its charming villages and of course the Mediterranean beaches. Within an hour you can be on the white sandy beaches of Fréjus (40 km) and Saint-Tropez (51 km). You can reach the quaint villages of Flayosc (13 km), Villecroze (14 km) en Tourtour (16 km) within half an hour. The famous Gorges de Verdon is 40 km away. Or reserve a day for a canoe trip, embarkation point in Entrecasteaux (13 km), on the river Argens. Along the 70 km long shores there are beaches everywhere for a romantic picnic.